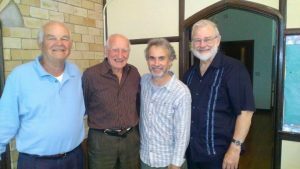 In October 2017, John Vincent met in Manchester, Connecticut, with three US colleagues with whom he has worked for many years: Geoff Curtis, Gary Richardson, and Don Rudalevige. Geoff is a retired episcopal priest living in New Jersey, Gary is a pastor of Belmont United Methodist Church in Massachusetts, and Don Rudalevige is a retired Methodist minister living in Maine. Each has been involved in urban ministry and the UTU both as practitioners and teachers working with local churches and dioceses, and each has spent time working with UTU in Sheffield. As they met again they thanked John for the helping them over the years to systematically approach urban work and the day was spent catching up on latest events in their respective contexts.